The Blues Hall of Fame member served as Chess Records' house guitarist for a number of years. 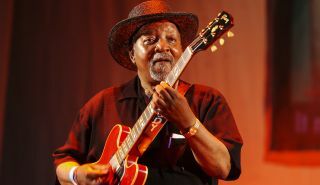 Jody Williams, a famed Chicago blues guitarist and Blues Hall of Fame member, has died at the age of 83. Williams succumbed to cancer at the at the Munster Med Inn in Munster, Indiana Saturday night, according to a statement from Alligator Records. Williams—known for a six-string style that evoked sophisticated, jazzy West Coast sounds and deep blues, with a touch of rockabilly for good measure—played on famed sides like Bo Diddley's "Who Do You Love" and "I’m Bad," Howlin’ Wolf’s "Evil" and "Forty Four" and Sonny Boy Williamson’s "Don’t Start Me Talking." Williams was born in Mobile, Alabama in 1935 and moved to Chicago with his family at the age of five. He began performing at clubs at the age of 17, and within a few years became the house guitarist at Chess Records, a role he served in until he was called into the army in 1958. Williams was inducted into the Blues Hall Of Fame in Memphis in 2013 and into the Chicago Blues Hall Of Fame in 2015. He is survived by his wife Jeanne Hadenfelt, four children and seven grandchildren. Our thoughts go out to his family and friends.